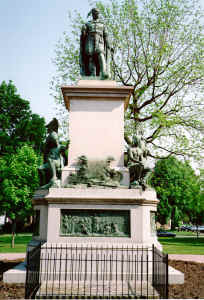 The Joseph Brant Monument was erected by the city of Brantford, Ontario, in recognition of loyalist Mohawk leader, Joseph Brant who fought on the side of the British during the Revolutionary War. 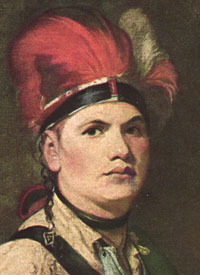 In 1784, following the War, Joseph Brant led some 1,843 Iroquois Loyalists from New York State to the land granted them in Ontario by Sir Frederick Haldimand as restitution for their losses in the war. Today, the Six Nations Reserve is located just outside of Brantford.
" 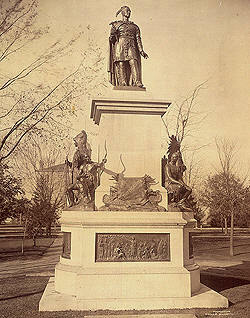 (From a suggestion made in August 1874), a monument in memory of Joseph Thayendanegea Brant, erected in the center of Victoria Park, was created by famous British sculptor Percy Wood. Wood made two visits to Canada to make sketches of the Six Nations peoples. 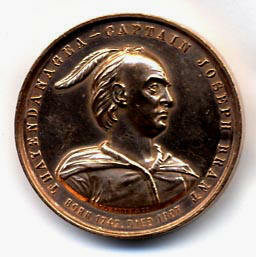 The figure of Brant and those representing the Mohawks, Oneidas, Onondagas, Cayugas, Senecas and Tuscaroras are cast in bronze. 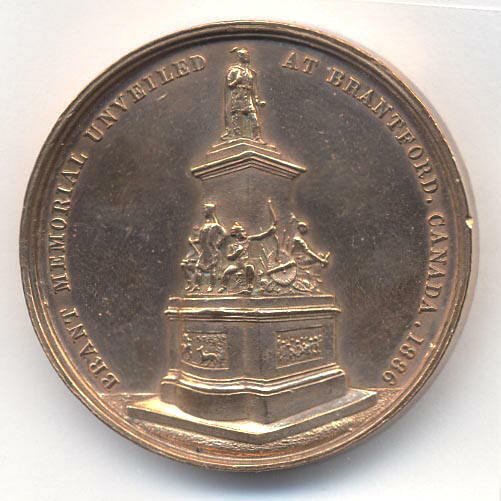 The bronze, from cannons used at the battles of Waterloo and the Crimean War, was donated by the British government in honour of Brant and the Six Nations people's support of the British during the American Revolution. 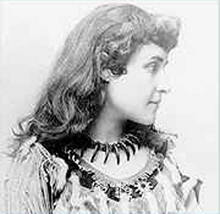 When the cornerstone of the monument was laid on August 11, 1886, William Cockshutt read the poem that talented Six Nations writer Pauline Johnson had written for the occasion. (Also in attendance was the Honourable John Beverley Robinson, Lieutenant Governor of Ontario.) 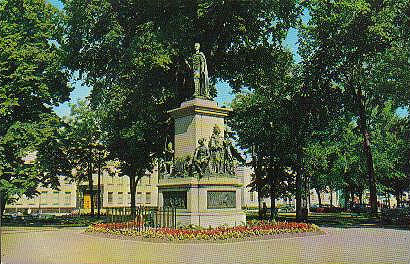 The monument was unveiled on October 13, 1886, and remains a centerpiece of Brantford's heritage. " " The idea for this memorial originated with the Hereditary Chiefs in 1874. In 1877 they allocated $5,000 (in a time when workers would be fortunate to make 75¢ for a 10-12 hour work day in a six-day work week this was a very considerable sum to be appropriated from the meager band funds) towards the project. 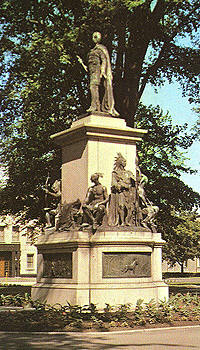 In 1883 (the Mississaugas of the) New Credit (Reserve) added $250 to this memorial for the Mohawk whom they had once adopted. The castings' bronze came from cannons, donated by the British Government, which had been used at Waterloo (1815) and in the Crimean War (1853-1856). A Chief Clench set the cornerstone August 11, 1886, with Nanticoke Chief Josiah Hill (Council's first Secretary, 1880 - 1915) chairing the event. Pauline Johnson wrote a poem for the occasion. 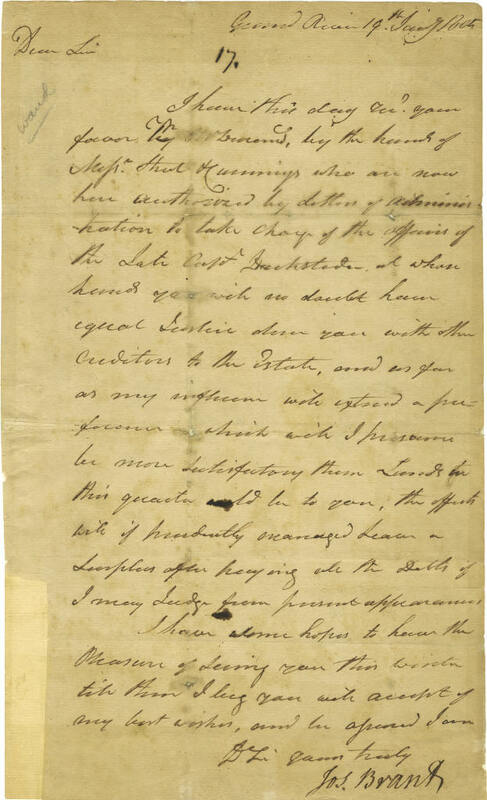 Her grandfather, War of 1812 veteran and former Council Speaker, John Smoke Johnson, was present; he had been born in 1792 and had known Brant. 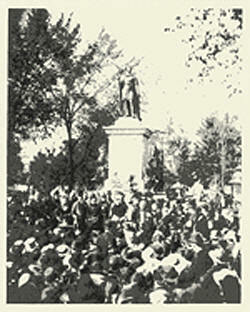 The statue was unveiled October 13, 1886. " 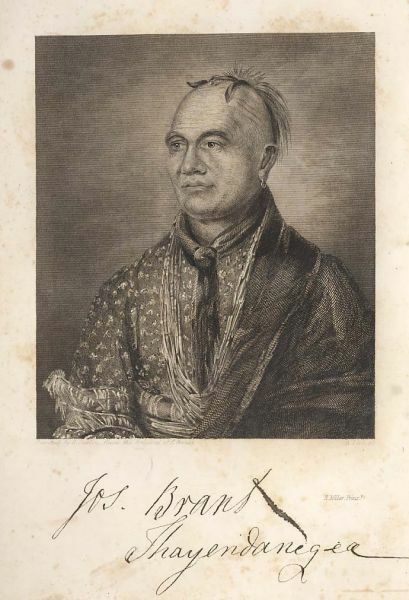 " Thayendanegea - Captain Joseph Brant Born 1842 · Died 1807 "
" Brant Memorial Unveiled at Brantford Canada · 1886 "
"Victoria Park was set aside as a square when Lewis Burwell surveyed the original town plan for Brantford in 1830. The square was first landscaped as a formal park in 1861. 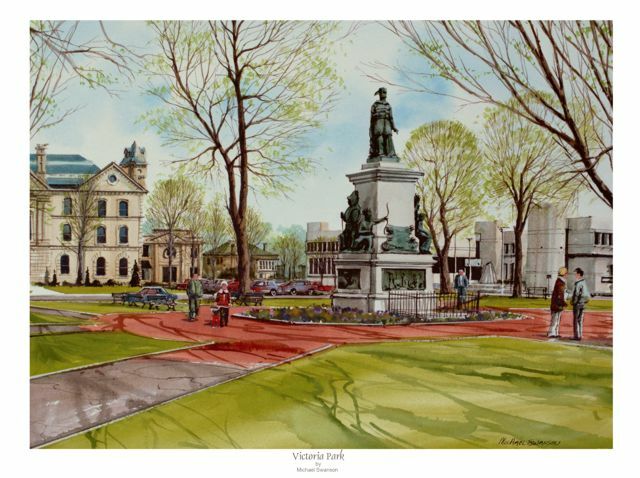 The plans were prepared by John Turner, a local architect who designed many significant Brantford buildings, including the Brant County court house, Zion United Church and Park Baptist Church, which face the square. In recognition of Upper Canada's link to Britain, Turner's plan was based on the configuration of the Union Jack. 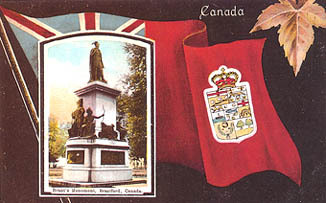 In 1886, the bronze and granite Joseph Brant Memorial was unveiled in the centre of the square. 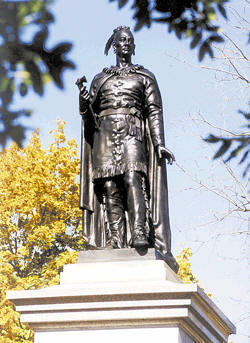 One of the first pieces of statuary of its kind in North America, the memorial to Joseph Brant and the Six Nations Confederacy was sculpted by Percy Wood, winner of the international competition. In 1892, the granite drinking fountain was located to the west of the memorial at the Market Steet entrance to the park. This fountain was donated by J. K. Osborne, who was a vice-president of A. Harris, Son & Co. and Massey-Harris Co. Ltd., forerunners of Massey-Ferguson Ltd.
Victoria Park was designated under the The Ontario Heritage Act by Brantford City Council on September 22, 1986, as having architectural and historic importance." Requires the FREE QuickTime Player. 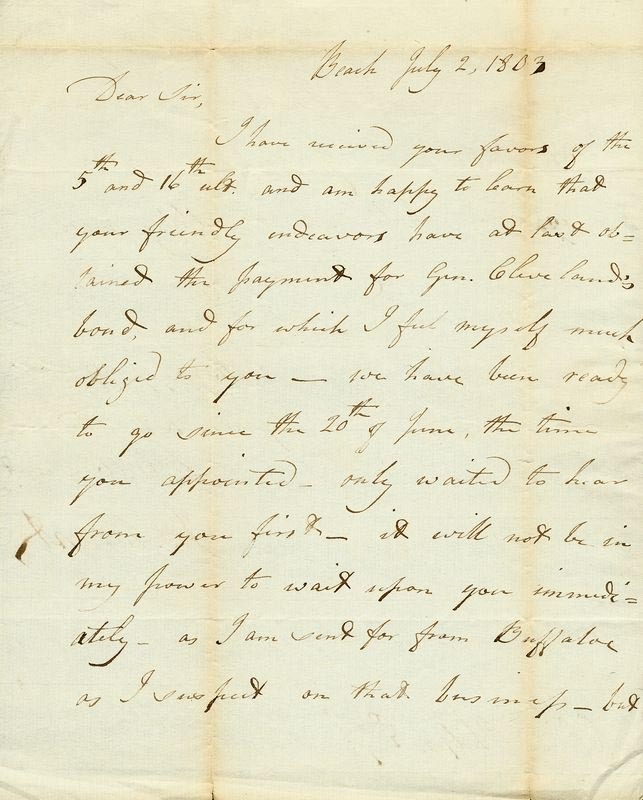 The following links are images of items offered for sale on Ebay; these three letters are dated 1801, 1803 and 1805. Her Indian graves and Indian memories. That unto Might and doubtful Right gives place. Their beauty lies in their vermillion glow. Without allegiance from thy Indian son. With red reflections from the Mohawk's arm. 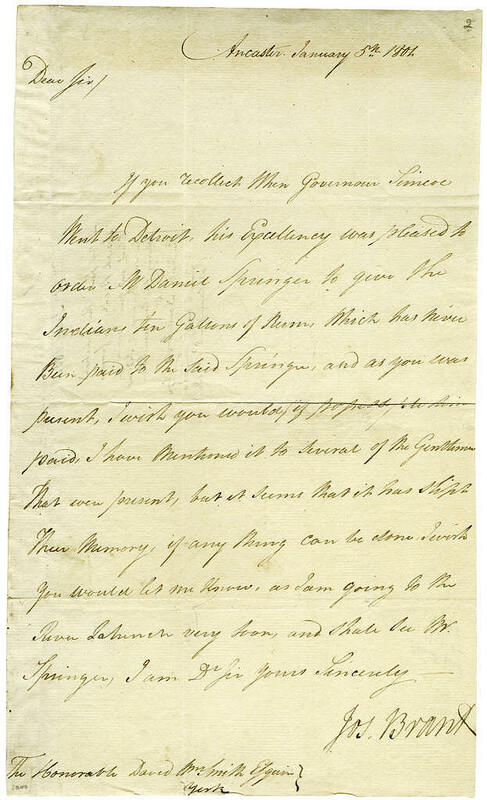 Of Brant, who linked his own with Britain's fame. And love the land where waves the Union Jack. The Six Red Nations have their Canada. To seek protection under other skies. Extends from far across the great salt wave. The loving hand of England's noble Queen.